We’ve had us a film about a horse. Seabiscuit got Oscar nods, of course. So another race horse on us they’ll force: Secretariat! 116 min. Walt Disney Studios Distribution. Director: Randall Wallace. Cast: Diane Lane, John Malkovich, Dylan Walsh, Dylan Baker, Margo Martindale. Disney schmaltz, more “pop” than art…Secretariat! She shows the malign she’ll win ev’ry time, with Secretariat! The flick serves sports “history” as main course. But for fam’ly fun, do I endorse? 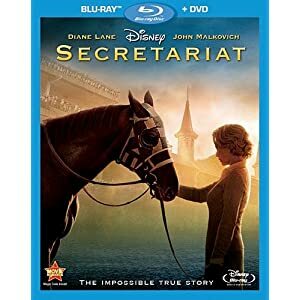 Disney delivers a solid hi-def transfer for Secretariat in a Blu-ray + DVD combo pack. The stylized image doesn't always look as naturally film-like as it perhaps could, instead leaning towards a look defined in post: detail proves inconsistent, with some blurry shots, and black level is noticeably weak much of the time, resulting in decreased shadow detail. Nevertheless, the transfer boasts many of the bells and whistles we've come to expect from hi-def, particularly blazingly vibrant color and texture and detail that easily trump standard def equivalents. The DTS-HD Master Audio 5.1 surround mix has nothing to detract from it: it's a potent and carefully structured soundscape that excels in quiet ambience, swelling music, and racetrack excitement. The disc comes outfitted with a number of bonus features, beginning with an audio commentary by director Randall Wallace. Wallace knows his stuff, and he's a steady commentator here, as well as a defender of the material he's written and directed (though he cops to some dramatic license here and there). “Heart of a Champion” (14:56, HD) gets into the true story, with comments from Diane Lane, Secretariat owner Penny Chenery, John Malkovich, Nelsan Ellis, Leonard Lusky of Secretariat.com, exercise rider Jim Gafney, author of Secretariat: The Making of a Champion Bill Nack, exercise rider Charlie Davis, Claiborne Farms owner Seth Hancock, Nester Serrano, director Randall Wallace, Otto Thorwarth, producer Mark Ciardi, and Keith Austin. “Choreographing the Races” (6:27, HD) features Wallace, Ciardi, horse wrangler Rusty Hendrickson, Thorwarth, Austin, and Kevin Connolly. “A Director’s Inspiration: A Conversation with the Real Penny Chenery” (21:12, HD) finds Chenery chatting with Wallace about her real experiences and becoming a sort of movie star at last. Seven “Deleted Scenes” come with a director’s introduction (:40) and optional commentary by Wallace: “Alternate Opening” (1:18, HD), “Memories” (1:01, HD), “Introduction” (:41, HD), “’Are You a Golfer?’” (1:52, HD), “Seth Joins the Team” (1:02, HD), “No Time to Rest” (2:27, HD), and “Too Soon to Celebrate” (1:47, HD). Also here are the “Music Video – AJ Michalka ‘It’s Who You Are’” (4:02, HD) and a Secretariat Multi-Angle Simulation: “Jockey” (3:43, HD), “Reporter” (5:09, HD), “Historian” (3:35, HD), “Spectator” (4:14, HD), and “Actual Race” (2:12, HD). These segments include CGI simulations of the 1973 Preakness Stakes race, with commentary by professional jockey Michael Smith, Daily Racing Form reporter Brad Free, MI Developments CEO Dennis Mills, and Horseracing Simulations CEO and spectator Mike Calderone; one can also watch actual video of the race with play-by-play. All site content © 2000-2019 Peter Canavese. Page generated at 04/20/2019 11:27:09PM.